Big data is on an upward trend throughout the world and companies are constantly on the lookout to find the right talent with the right skill sets in order to succeed in the changing marketplace. On the home front, the Malaysian government, positioned as a data driven nation, aims to create 20,000 data professionals by 2020. The Center of Applied Data Science (CADS), is ASEAN’s first and only one stop platform and center of excellence for Data Science in the ASEAN region to empower the next generation of Data Professionals. 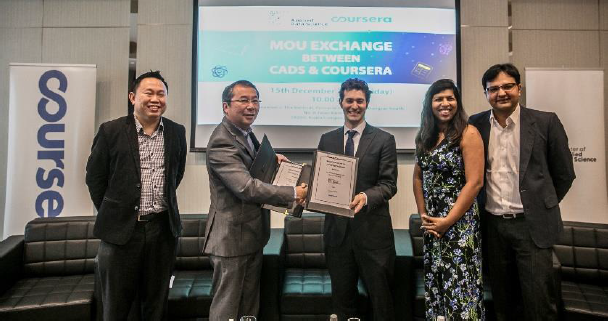 In line with this objective, CADS is collaborating with Coursera, the largest ‘massive open online course’ (MOOC) platform in the world to offer a host of data science courses to Malaysians. during the Exchange of Documents Ceremony between The Center of Applied Data Science (CADS) and Coursera. Through this collaboration, working professionals and university students will now be able to pursue their dream career in the field of data science. They can complete the one-year online education programme by taking advantage of the 11 online courses of international standards, offered by premier global institutions. Students will also have access to CADS Learning Hubs coupled with weekly personalized tutoring session with highly trained and experienced Data Scientists. The course will begin in February 2018 and be priced at RM4,999 for working professionals and RM3,599 for students. The fee covers examination and quizzes; lab access, and the guidance of a data scientist an hour per week throughout the whole learning process. Online registration commences on 15th December 2017 with a special discount of 10% offered to individuals who register before 31st December, 2017. Pursue your career in Data Science and enjoy your savings today!